In the high jump and pole vault, a jump off is used to determine the winner, but ties are permitted for the other placings. One has to look back at the drama from the women’s High Jump at the 1984 Olympics with the dual between Germany’s Ulrike Meyfarth’s and Italy’s Sara Simeoni. Other field events, such as Long Jump or Shot Put, uses the second best performance to determine the winner and overall placing. Do you remember the shot put at the 2004 Athens Olympics? Adam Nelson threw 21.16 m (69 feet 5 inches) on his first attempt, then fouled throws # 2,3,4,5. Yury Bilonog also threw 21.16 m on his 6th attempt, and Nelson fouled his last throw. Without a second legal throw, Nelson “won” his second silver Olympic medal. Alan Wells and Mike McFarlane TIED for first place and the Gold medal at the 1982 Commonwealth Games 200m… a rarity in today’s high speed photo finish cameras with resolutions of up to 1000th of a second (i.e. 10.001 vs 10.002). Photo finish cameras used in motor car events are capable of 10,000th of a second. For other trivia on Alan Wells, check out this video where Wells does not use starting blocks in his 100 meter final. Today, this would not happen with the mandatory pressure sensitive starting blocks. 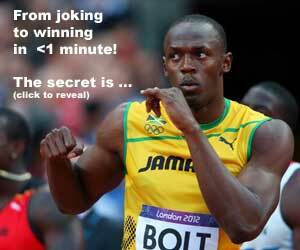 READ How Fast can Usain Bolt Run?